Other obvious differences are the hands and crown - the earlier ones above have a domed crown like the regular 200m, rather than straight edged. That said, the later tonneau case below belonging to TZAG has a domed crown and the caseback engraving is different to Ill-Phill's tonneau example at the top - the lower engraving is missing. All of these variations reflect the hand assembly - the common feature of all of these 300m divers is the dial, which certainly looks hand lumed. In summary, all versions have the same dial but there are three cases - D-lug, swing lug and tonneau; two bezels; two types of hands and two main types of caseback (30 ATM or 300m), in satin or polished finish with further variations of the 300m version - with and without lower engraving or serial number, all reflecting the uniqueness of these very rare military watches. All seem to be in very good or NOS condition, perhaps indicating that they are storeroom refugees? After the creation of " [Amfibii]" at our proposal the International standard was changed by the hours for the underwater floating. In it was included the point about that which if is under water perpendicular to head or buttons of hours to exert effort, then they must not pass moisture. Is certain, " [Amfibiya]" it satisfied this requirement. Was let out the military modification of " [Amfibii]" - [NVCH]-30. 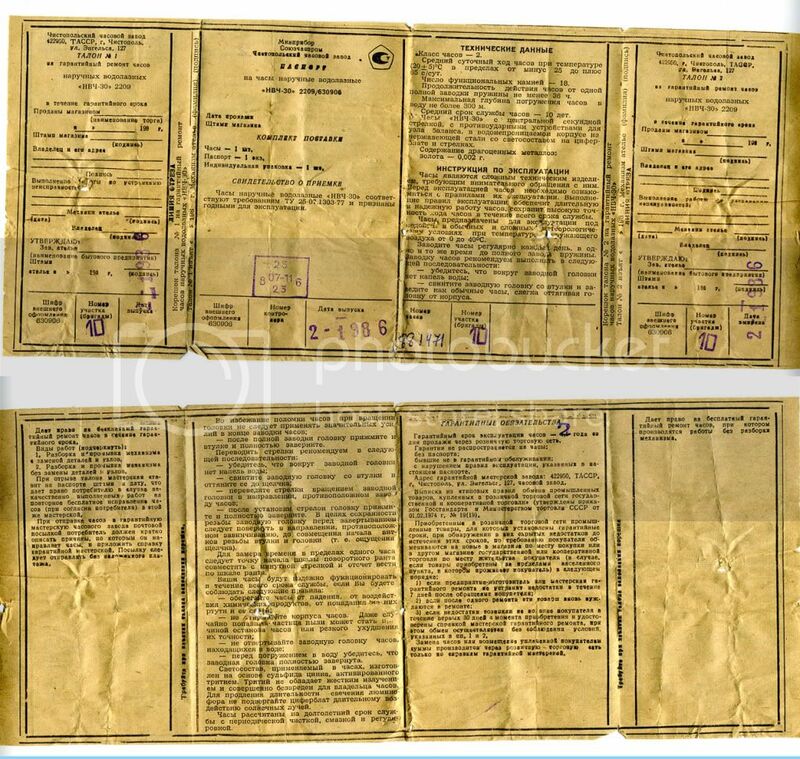 When seamen arrived in [NIICHASPROM] with the order for the hours for the divers, they said to them that in Chistopol' the similar model already is let out. In order to ensure that required to fleet airtightness to 30 atm, for us it was necessary to modify series " [Amfibiyu]". [NVCH]-30 were characterized by the configuration of glass, thicker cover. These hours were tested according to the very wired program. Even belt pA strength checked. By the way, fastening in belt on [NVCH]-30 also was its, a little strange to form, but very durable. Major portion of the tests was conducted in [NIIChASPROMe], and acceptance were passed during the studies of fleet in the North Sea. By the way, on them they rehearsed something more similarly to the rescuing of the crew of " [Kurska]". Submarine (then, true, diesel) lay on the bottom at the depth of 120-130 meters, imitating emergency. There were two rescue ships, colossal floating crane of " [Karpaty]" , diving bells, the camera of decompression, the brigade of divers. I do not know, where this all disappeared now. The diagram of work is such. Bell gets down from the ship, is established on special **** area on the boat, is forced against it due to the pressure. The people pass from the boat into the bell, they raise upward into the decompression chamber. One group of seamen of six people raised on those studies. Our hours were in the divers, who worked at the depth. Both tests and studies passed well.During these tests the hours were checked at the maximum depths - more than 100 meters, although actually they were intended for other purposes. In divers -[glubokovodnikov] a constant radio communication with the ship, yes even in their heavy equipment at this depth it is simply inconvenient to look at the hours. But they were irreplaceable for the scuba divers, the combat swimmers our [NVCH]-30. Returning to Jie Hong's photo at the beginning, I vaguely recall reading somewhere that the depth rating of the Zlatoust was 300m, although Peter from Bremont doubted its water resistance due to the flat glass. 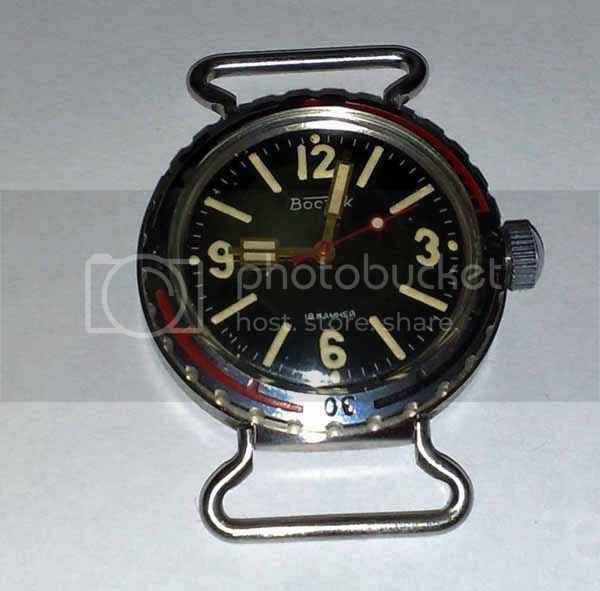 Could it be that the 300m Vostok was conceived as a replacement for the pocket watch movement Zlatoust, which does appear to come from an earlier age? The Vostok may be smaller but every effort was made to make the dial as legible as possible. As you will appreciate, due to the rarity of these watches (just 200 are believed to have been made) the only way to compile this post was to use the above photos, which have been credited where possible. P.S. 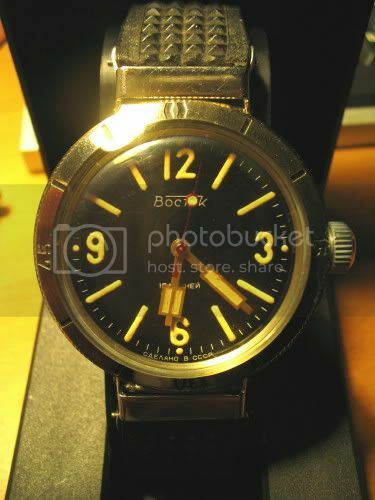 In case you were wondering, yes, I do have a 300m Vostok in my collection. Last edited by StampeSV4; 28-12-2009 at 23:39. 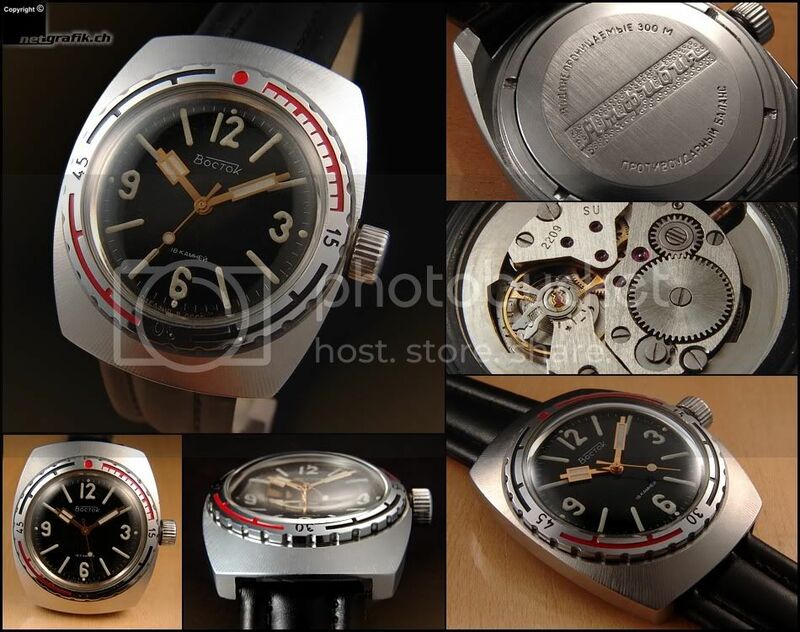 A nicely consolidated post on the several variations of the 300M Vostok Amphibian, 1 was sold yesterday. I missed the winning bid by 30 euros. 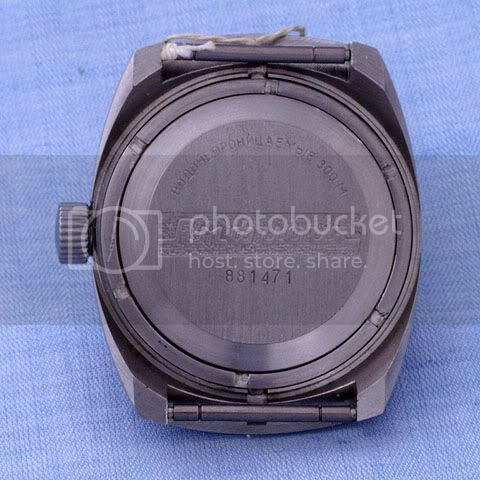 Another different variation of the case back, it has the Vostok logo on it. Hope you don't have to wait too long before the next one appears, although I saw that another post said the last one sold on WUS was over a year ago. 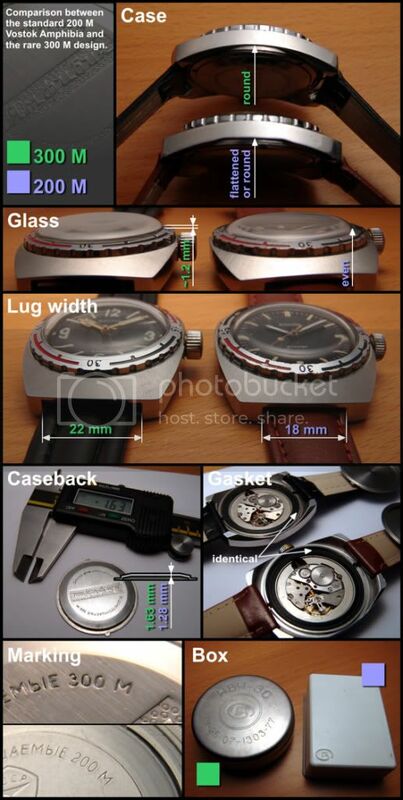 Due to the rarity of these watches I assume that the number of known examples can only barely be in double figures. I have been searching for the early Amphibian with the hinge lug high and low. I can't find them anywhere ! I didn't know about the 300m Amphibia model up to now. 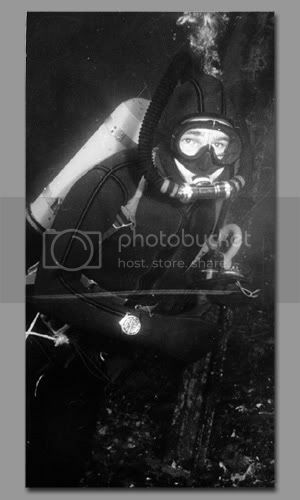 As I'm totally into vintage divers this is really interesting !!! Thanks for the positive comments Jie Hong and Andreas. 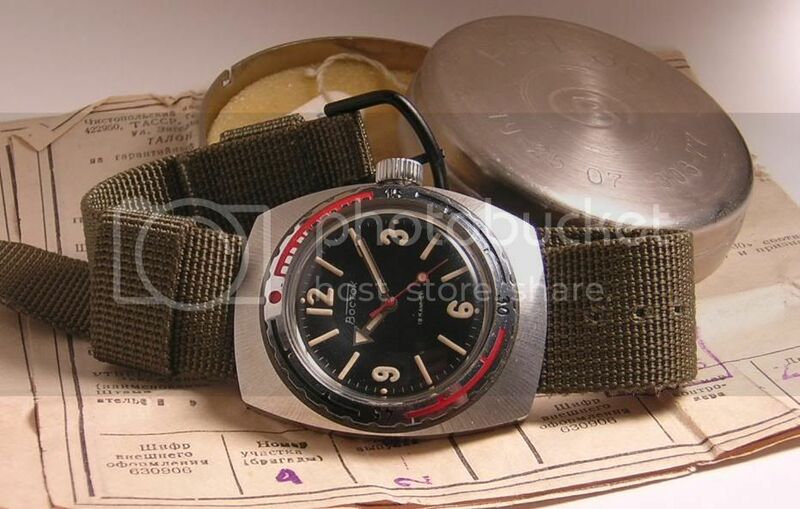 I hadn't really realised just how unique these Vostok 300s were until I started my research. It took quite a while to locate the information - there is no reference to it in any of the books I have read on military watches, which only mention the Zlatoust. 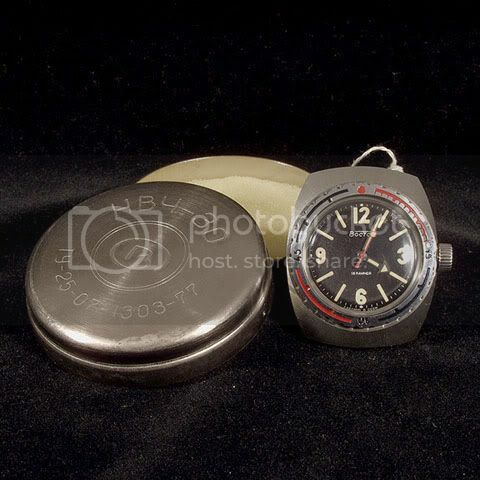 What intrigues me most about the Russian military watches is when you compare them to their western contemporaries - the Soviets always seemed to be a decade or two behind. I suppose you could think of the tonneau cased 300 as a sort of Russian Benrus Type I/II, or maybe a CWC? The spec's are similar. (I will post some comparison photos soon). 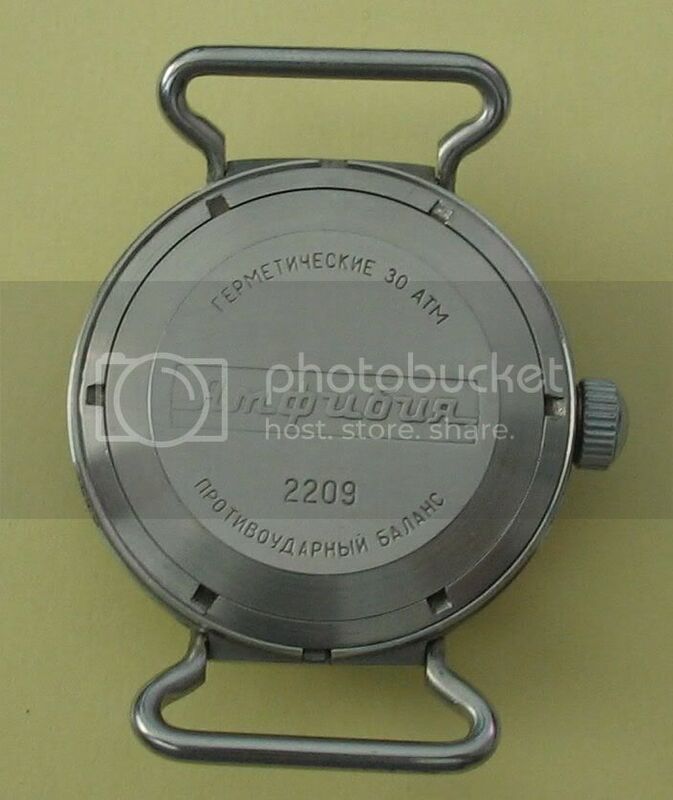 No-one seems to know for certain what replaced the Zlatoust in the USSR - the GDR started using the quartz "NVA Ruhla", which appeared around the same time as the mechanical tonneau cased Vostok 300. 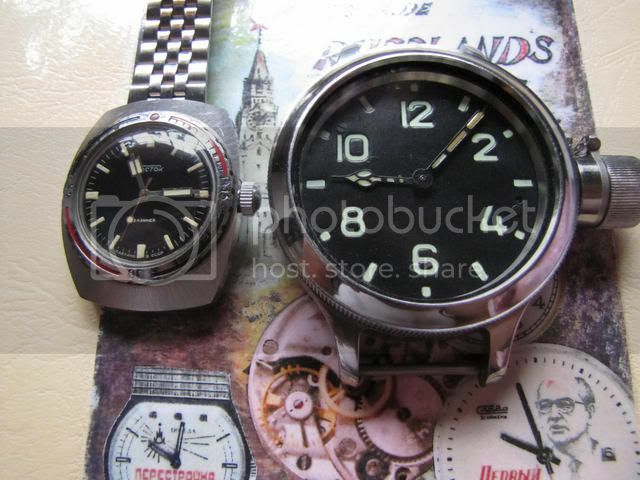 (More Ruhlas were made although they seem almost as rare as the Vostok - c.25 known Ruhlas on the database and you need to know how to spot a reissue or Hong Kong copy). 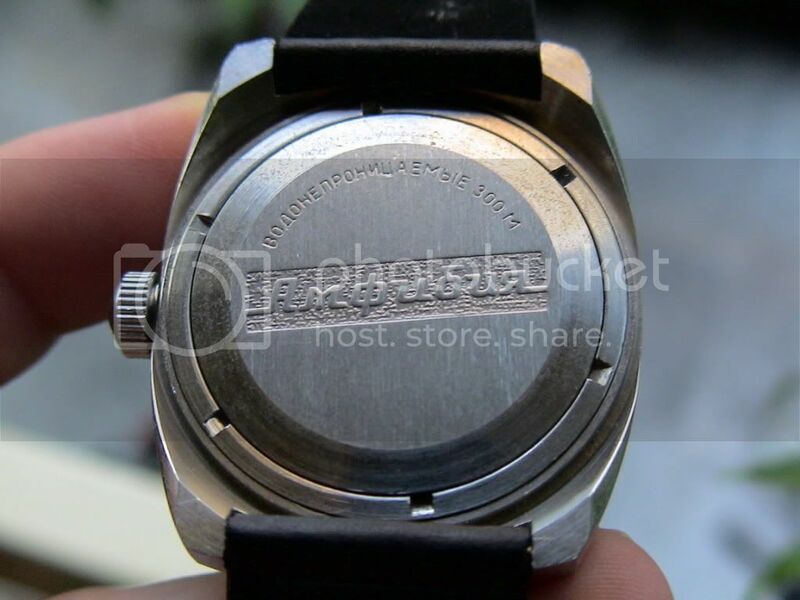 http://forum.atgvintagewatches.com/s...ead.php?t=1570. The GDR also used Glashuttes. 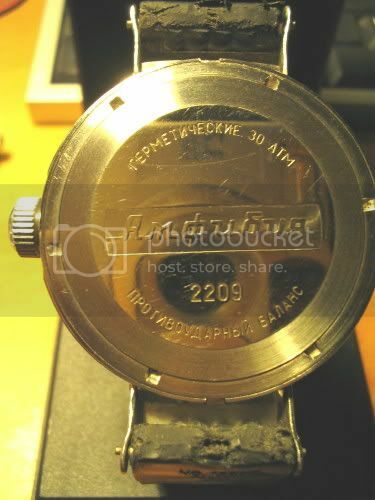 I suspect that all of these watches would have been used by the eastern bloc combat swimmers concurrently, as the interview with the Vostok designers clearly states how the 300s were "irreplaceable" for the Soviet combat swimmers. 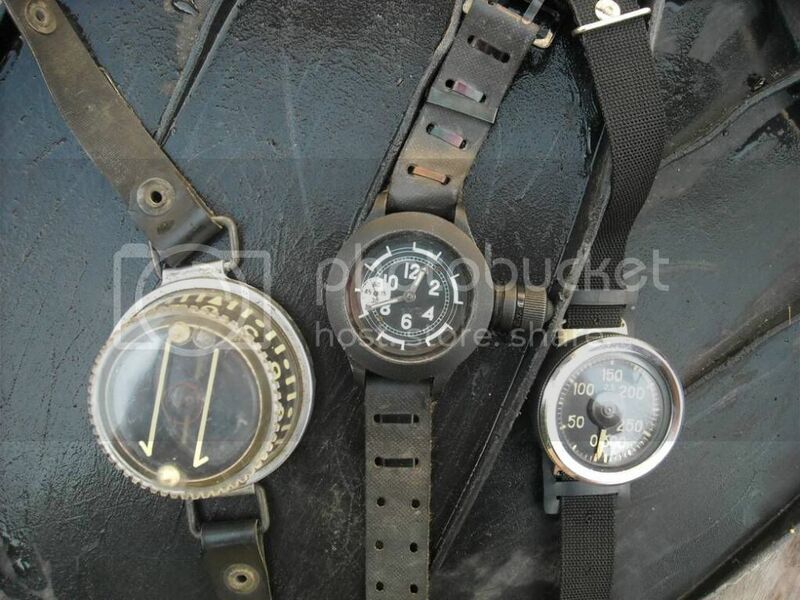 Even after the smaller, more modern watches appeared, I expect that the tried and tested Zlatousts were still used for training. 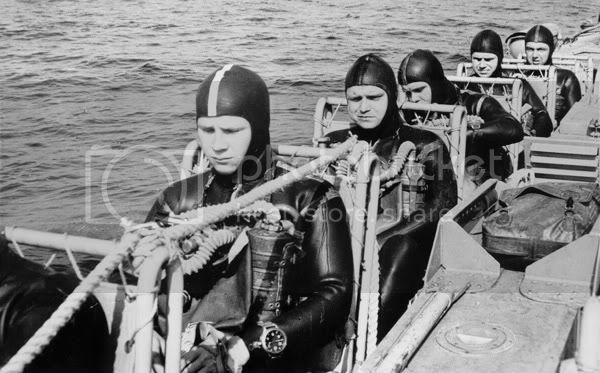 Maybe the Zlatousts were always used by hard hat divers, with perhaps later on the combat swimmers using them for training only as they became superceded, swapping to the smaller watches for missions? All this is purely hypothesis. (Further complicating matters, the tonneau cased 300s are believed to have been made in '86 but the original civilian 200m tonneau case design dates from '67 and I have not yet discovered when the earlier military 300m D-lug and swing dial versions were introduced). The Kampschwimmers were disbanded in the early '90s after the Union was dismantled. Last edited by StampeSV4; 29-12-2009 at 14:33.